How Effective Are Our Food Regulations? The following is an excerpt of The Poison Squad by Deborah Blum. We tend these days to cast a romantic glow over the foods of our forefathers. In such rosy light, we may imagine grandparents or great-grandparents thriving happily—and solely—on farm-fresh produce and pasture-raised livestock. We may even believe that they ate and drank in a world untouched by the chemically enhanced and deceptive food manufacturing practices of today. In this we would be wrong. By the mid-nineteenth century, in fact, many foods and drinks sold in the United States had earned a reputation as often untrustworthy and occasionally downright dangerous. Milk offers a stunning case in point. Dairymen, especially those serving crowded American cities in the nineteenth century, learned that there were profits to be made by skimming and watering down their product. The standard recipe was a pint of lukewarm water to every quart of milk—after the cream had been skimmed off. To improve the bluish look of the remaining liquid, milk producers learned to add whitening agents such as plaster of paris or chalk. Sometimes they added a dollop of molasses to give the liquid a more golden, creamy color. To mimic the expected layer of cream on top, they might also add a final squirt of something yellowish, occasionally pureed calf brains. “Where are the police?” demanded New York journalist John Mullaly as he detailed such practices and worse in his 1853 book, The Milk Trade in New York and Vicinity. Mullaly’s evidence included reports from frustrated physicians stating that thousands of children were killed in New York City every year by dirty (bacteria- laden) and deliberately tainted milk. His demands for prosecution were partly theater. Despite his and others’ outraged demands for change, no laws existed to make such adulterations illegal. Still Mullaly continued to ask, when would enough be enough? The most popular preservative for milk—a product prone to rot in an era that lacked effective refrigeration—was formaldehyde, its use adapted from the newest embalming practices of undertakers. By the end of the nineteenth century, the sweeping industrial revolution—and the rise of industrial chemistry—had also brought a host of new chemical additives and synthetic compounds into the food supply. Still unchecked by government regulation, basic safety testing, or even labeling requirements, food and drink manufacturers embraced the new materials with enthusiasm, mixing them into goods destined for the grocery store at sometimes lethal levels. The most popular preservative for milk—a product prone to rot in an era that lacked effective refrigeration—was formaldehyde, its use adapted from the newest embalming practices of undertakers. Processors employed formaldehyde solutions—sold under innocuous names such as Preservaline—to restore decaying meats as well. Other popular preservatives included salicylic acid, a pharmaceutical com- pound, and borax, a mineral-based material best known as a cleaning product. No wonder, then, that when alarmed citizens began pushing for federal help in checking such fraud and fakery, they did so under the banner of purity. They saw themselves as “pure food” crusaders, fighting to clean up not only a contaminated supply chain but also a system that was dirty to its roots and protected by politicians friendly to industry. As Mullaly had done decades earlier, the new crusaders—scientists and journalists, state health officials and leaders of women’s groups—loudly deplored their national government’s willingness to allow such corrupt practices to continue. The leaders of the pure-food movement united behind the idea that regulatory oversight was the only realistic answer. They’d seen many times that the country’s food processors and manufacturers felt little or no responsibility to protect the food supply, especially if it meant reducing profits. Formaldehyde, for instance, had been directly linked to deaths—notably of children drinking what came to be called embalmed milk—without any move by producers to discontinue the preservative’s use. The preservative’s usefulness in salvaging bad milk—otherwise unsalable—was too valuable to lose. American corporations had successfully and repeatedly blocked efforts to pass even modest food safety legislation. This especially galled consumer safety advocates because governments in Europe were enacting protective measures; some foods and drinks sold freely in the United States were now banned abroad. Unlike their American counterparts, European beer and wine makers were blocked from using risky preservatives in their beverages (although they could put them in products destined for U.S. sales). Many of the several hundred pure-food advocates at the congress saw their best chance for progress in what might have seemed an unlikely source of heroics: a small chemistry unit in the U.S. Department of Agriculture and its chief scientist, a middle-aged Indiana native who’d trained in chemistry at Harvard University. But that was, in reality, a savvy choice. Decades before the federal government had even considered anything resembling a food and drug administration, the Department of Agriculture (created in 1862 by President Abraham Lincoln) was tasked with analyzing the composition of American food and drink. It was the only agency to do so and that work was mostly in response to unhappy farmers who saw manufactured food undercutting their market. An 1870s complaint from a Minnesota agricultural association asked the division to investigate the “misapplication of science to deodorize rotten eggs, revive rancid butter, and dye pithy peas” green again. But it wasn’t until the Agriculture Department named Harvey Washington Wiley chief chemist in 1883—recruiting him from a job at Purdue University—that the agency began methodically investigating food and drink fraud. Although best known as an expert in sugar chemistry, Wiley had studied food fakery while still in Indiana and had warned then that “counterfeit” products could be considered a threat to public health. Upon arrival at the Agriculture Department, he promptly initiated a series of investigations of products ranging from butter to spices to wine and beer, building a detailed and sometimes horrifying portrait of the country’s food supply. Those reports would lead him, in the early twentieth century, to test some of the most suspect chemical additives on human volunteers, a series of experiments dubbed the “Poison Squad” studies by the nation’s newspapers. His food and drink investigations—and the detailed criticism they contained—both infuriated manufacturers and alarmed Wiley’s business-minded supervisors. But he refused, under pressure, to stop the studies. And as the pure-food advocates noted with admiration, Wiley stuck by his research—and his researchers—even when they reached conclusions that embarrassed powerful corporate and political interests. Even worse, in the view of those interests, he publicized the findings. He steadfastly sought to inform not just government officials and lawmakers but also the public at large—including pure-food activists—about what his investigations revealed. The years of research findings, he told a congressional committee, had convinced him that polite resignation was unacceptable. And Wiley tended to stand out anyway. He was a tall man, dark haired and dark eyed, imposing in stature, humorously charming in private, by turns ministerial and theatrical in public. He would become the best-known face of the national battle for food safety regulation at turn of the twentieth century, building an alliance of consumer advocates and rallying them, in the face of repeated setbacks, to stay in the fight. He was America’s first great food safety chemist, but his greatest contribution to the cause—even more than the scientific work he conducted and supervised, even more than his considerable ability to dramatize the cause—was “the inspired generalship he offered,” wrote public-health historian Oscar Anderson Jr. Wiley, he added, “was the one leader who consistently saw the big picture,” the long-term goal of strong consumer protection. Yes, we are still fighting for pure food. But let us recognize that we’ve come a wonderfully long way from the unregulated food, drink, and drug horrors of the nineteenth century. Wiley also had his imperfections. The son of a lay preacher, he tended to claim the moral high ground largely for his alliance alone. Faced with hostility, he became more rigid in his stance, often refusing to compromise even on small details. He quarreled over pictures on labels as firmly as he quarreled over toxic compounds in baked goods. His refusal to make nice, even when nitpicking, strained his alliances and, some felt, limited his effectiveness. He knew that too. He failed, Wiley himself believed, to achieve the kind of fearlessly tough regulatory protections he wanted for his country. He could not forget or forgive the times that he’d stood up alone in—and some- times lost—the fight against corporate interference in the law. His own criticisms of his grand achievement—the passage and enforcement of the landmark 1906 Pure Food and Drug Act—may well have undercut our perceptions of his accomplishments and caused us to undervalue his contributions. But in that too we would be wrong. Yes, we are still fighting for pure food. But let us recognize that we’ve come a wonderfully long way from the unregulated food, drink, and drug horrors of the nineteenth century. And in an era when business interests rail—as they did in Wiley’s time—about government overreach and the need to eliminate regulations, we should remember how much Wiley’s work laid the foundation that allows us to stand up to that. He changed the way we regulate, and he was essential in changing the way we think about food, health, and consumer protection. 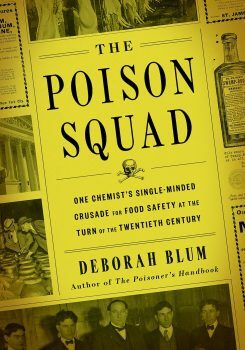 From The Poison Squad by Deborah Blum, published by Penguin Press, an imprint of Penguin Publishing Group, a division of Penguin Random House LLC. Copyright © 2018 by Deborah Blum.